unlimited, clickable from inventory slot. 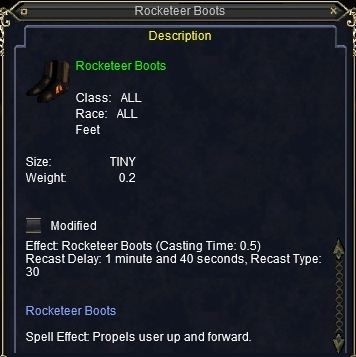 cooldown is tied to the item used, so you can use multiples of this boot to go higher than they intended. Expect they will nerf this with a lore tag. Just in case anyone is wondering, this no longer works. The recast type: 30 text means that they all share a cooldown now. Also, you don't fly nearly as high if you have levitation on.